for today and for the next seven generations. The Indian Health Service (IHS), an agency within the Department of Health and Human Services is responsible for providing federal health services to American Indians and Alaska Natives. This relationship, established in 1787, is based on Article I, Section 8 of the Constitution, and has been given form and substance by numerous treaties, laws, Supreme Court decisions, and Executive Orders. St. Croix began provding health care in mobile units in each of the communities in the 50's and 60's. The focus at this time was preventative medicine and immunizations. By the mid 70's and early 80's a small clinic was established in the tribal center with rent-a-doc's and contracted services. 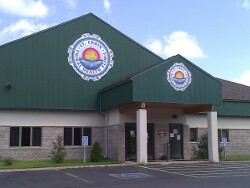 In 2000 the St. Croix Chippewa Indians of Wisconsin opened the doors to the new facility housing behavioral health, medical, dental, optical, community health and HOC/HOF/WIC. Our services continue to grow to meet our community needs. Our latest addition to our quality, efficient healthcare is electronic health records(EHR), implemented in Oct. 2010.